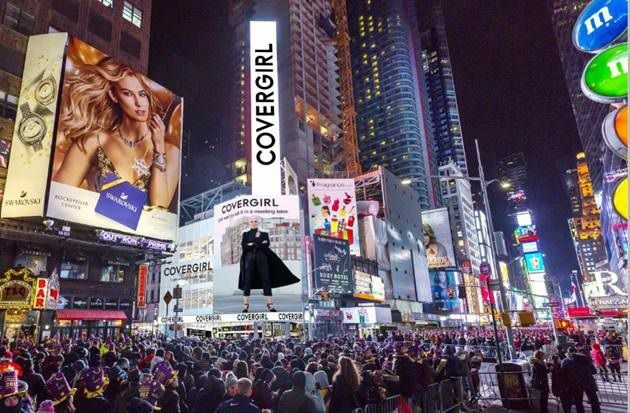 There’s a new kid on the block, and her name is CoverGirl. For the first time in upwards of 60 years, the household name in the mass makeup and beauty world is setting up shop in a brick-and-mortar, situated in the heart of NYC’s Times Square. The first-ever standalone shop is rumored to include additions like a beauty playroom and full-service makeup application, to name a few. Last October, the makeup brand said goodbye to its longstanding “easy, breezy, beautiful” campaign, and hello to “I am what I make up” in a re-branding campaign that aimed to encourage people to be "unapologetically themselves." Popular faces behind the inclusivity-focused re-brand included Katy Perry, Ayesha Curry and Issa Rae, among others. According to Elle, "We believe that makeup is a powerful tool for creativity and self-expression," Ukonwa Ojo, the senior vice president of CoverGirl at Coty said in a statement. "Opening a concept store will help bring this brand purpose to life in an immersive, elevated, and multidimensional way." In a world where physical fashion-focused storefronts are competing with the digital retail space, beauty brands like Glossier — who just opened its second showroom — are keeping the industry hopeful. No other mass beauty brand has ever opened a brick-and-mortar location in North America, so the ball is in CoverGirl’s court. Learn more about CoverGirl’s new storefront here.